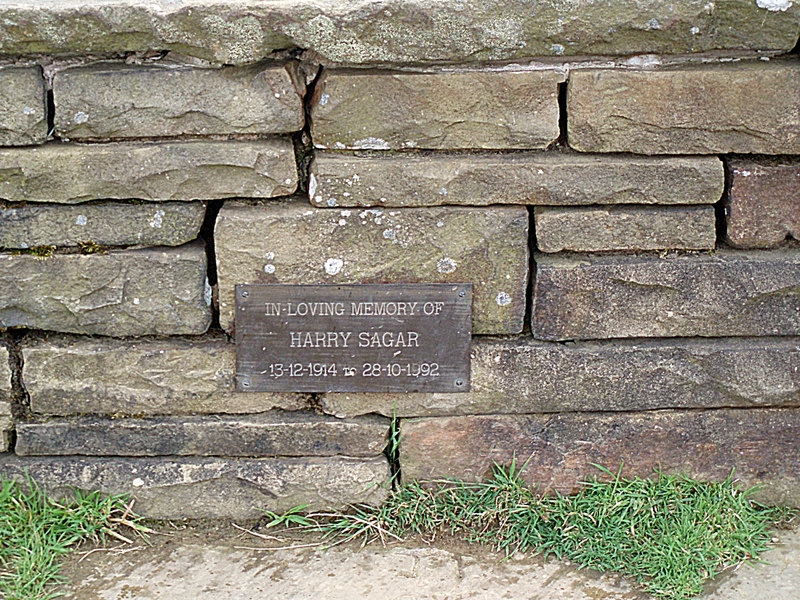 Harry Sagar - "In loving memory of HARRY SAGAR" 13-12-1914 -28-10-1992"
From information gleaned on the Internet in particular Gary Whiteheads site, he married a Ms Jean Stuart, a daughter and also two granddaughters. His family have very thoughtfully placed a plaque on approximately the highest place of the "Rossy Way" Fabulous view Harry - I've seen it in all weathers too! I guess the swoosh of the windfarm isn't too bad! 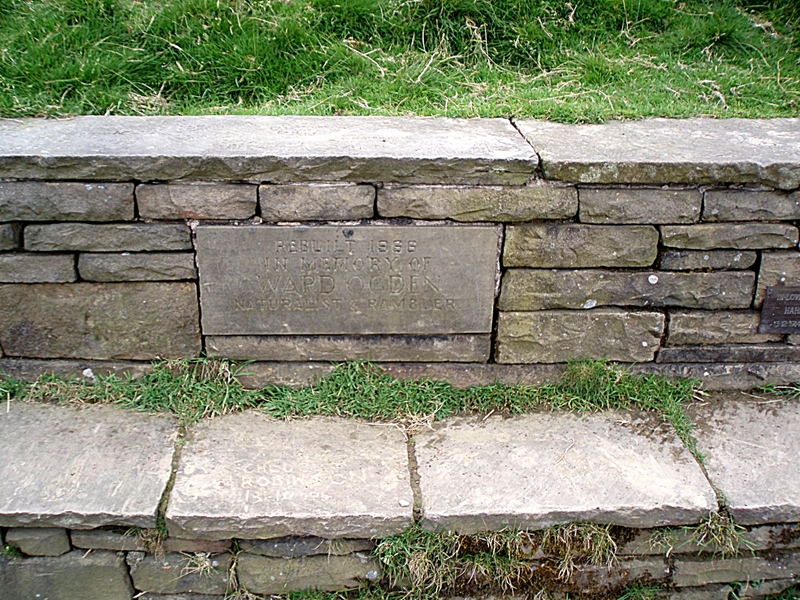 Ward Ogden has a stone dedicated to him on the Rossendale way too. 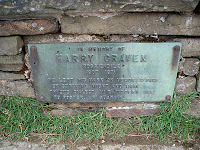 His is placed very close to Harry Sagar's stone. 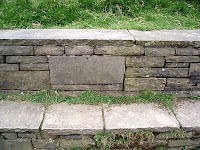 It reads "REBUILT 1966 IN MEMORY OF WARD OGDEN NATURALIST AND RAMBLER" The stone is set within the reconstructed "Waugh's Well" More about Edwin Waugh next. Edwin Waugh was born in Rochdale in 1817 and died in New Brighton in 1890. son of a shoemaker, and, after a little schooling, apprenticed to a printer, Thomas Holden, at the age of 12. While still a young man he worked as a journeyman printer, travelling all over England, but eventually returned to his old job in Rochdale. Waugh read eagerly, and in 1847 became assistant secretary to the Lancashire Public School Association and went to work in Manchester. He first attracted attention by his sketches of Lancashire life and character in the Manchester Examiner His first book Sketches of Lancashire Life and Localities was published in 1855 while he was working as a traveller for a Manchester printing firm. 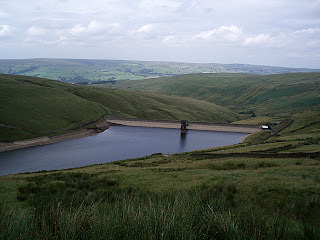 He wrote also in prose "Factory Folk", "Besom Ben Stories", and "The Chimney Corner". By 1860 he was able to become a full-time writer but by 1881 he was in poor health and was granted a Civil List pension of £90 p.a. 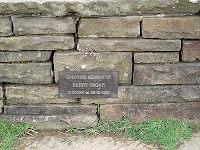 His best work was, perhaps, his Lancashire Dialect songs, collected as Poems and Songs (1859), which brought him great local fame. 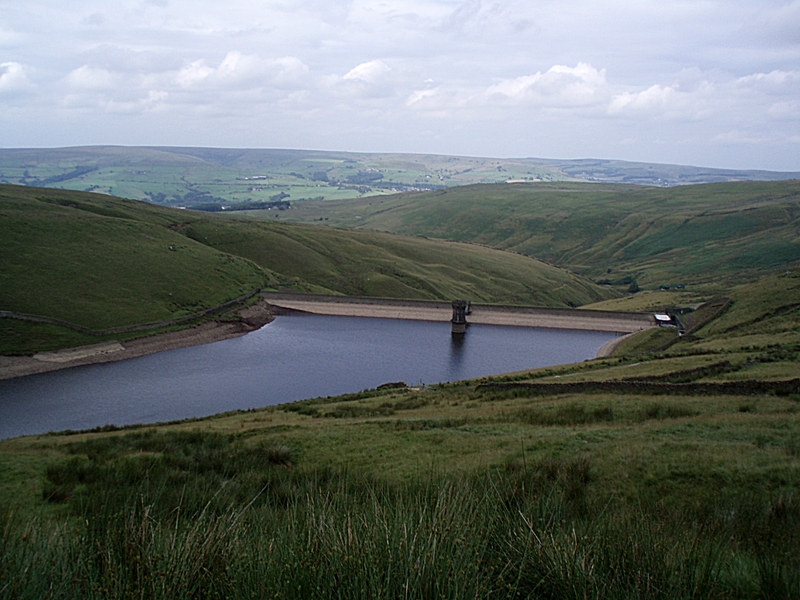 He was possessed of considerable literary gift, and has been called "the Lancashire Burns." His most famous poem is "Come whoam to thi childer an' me", 1856. 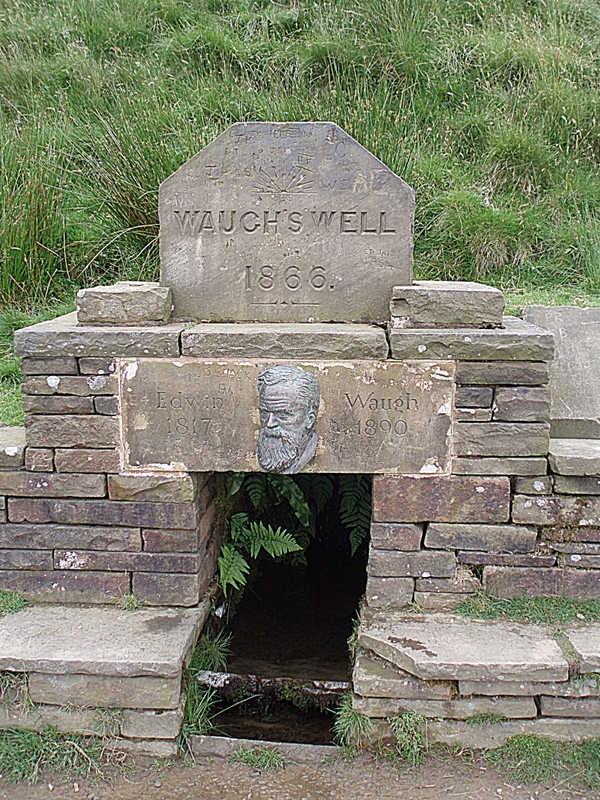 Waugh's Well was built in 1866 to commemorate him at the now derelict Fo' Farm, where he spent much time writing, on the moors above Waterfoot, Rossendale. 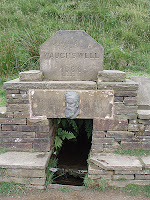 Waugh died at his home in New Brighton, near Liverpool, in 1890 and was buried in St. Paul's churchyard on Kersal Moor. There is another link to Edwin Waugh and Grants Tower here. "Published works: Jt. author w the late Alice Miller, Accrington Miscellany, 1970; Rossendale Anthology. 1969; Jt. 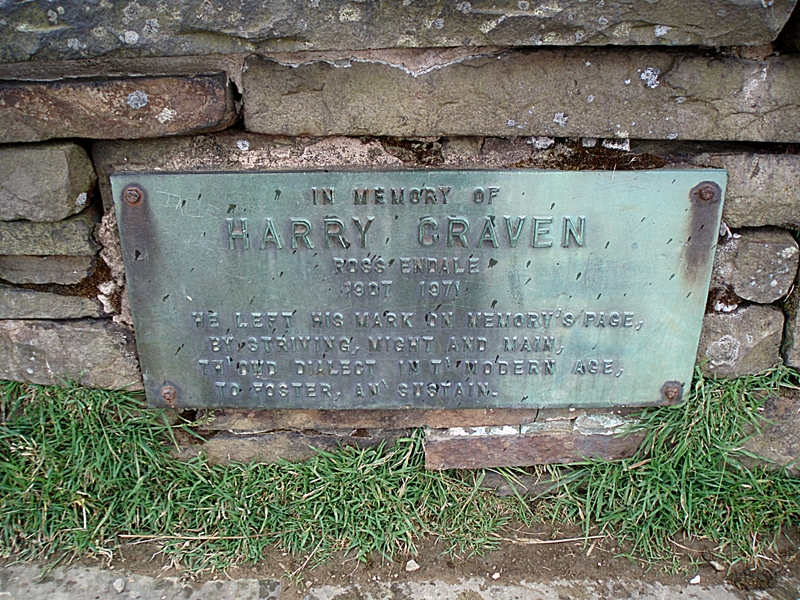 author w. the late Harry Craven, Bacup Miscellany, 1972. Contbr. to The Record. Recip., The Scholes Cup for Dialect Poem, ..."
Goodness knows what these 4 chaps would have thought of Facebook, texting and th'internet!